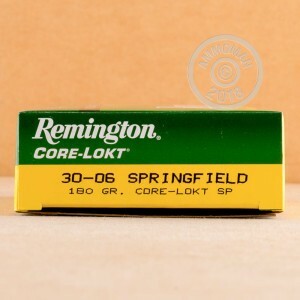 This Remington Core-Lokt 30-06 SPR ammo is perfect for your next deer hunt. 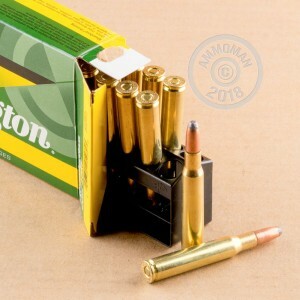 This ammo has a 180 grain soft point projectile. Soft point ammunition expands after hitting its target, adding to the bullet's ability to cause damage, and killing whatever game you are hunting faster. Remington Core-Lokt ammo has an interlocked jacket and core, which greatly increases weight retention after penetrating its target. This weight retention also adds to the bullet's ability to cause damage, and rapidly drops your target. Each round has a reloadable brass case, is Boxer-primed, and is non-corrosive. 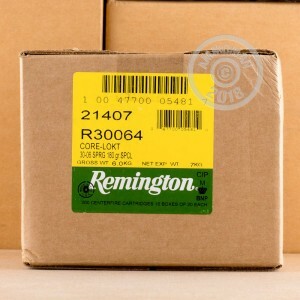 Remington has a history of producing affordable and effective hunting ammunition for American gun owners. Whether you are hunting squirrel or moose, Remington has a round to fit your hunt and your budget.